Blood pressure is recorded with two numbers. Systolic pressure (high number) is the force on which your heart pumps blood around your body. Diastolic pressure (lower number) is the resistance of blood flow to blood vessels. They are both measured in millimeters of mercury (mm of HG). Reading a blood pressure between 120/80 mm of HG and 140/90 mm of HG can mean that if you do not take steps to keep your blood pressure under control then you are at risk of initial high blood pressure. It is not clear what causes high blood pressure, but certain things can increase your risk of high blood pressure (hypertension. Healthy lifestyle can help reduce your chances of getting high blood pressure (hypertension) and help to maintain your blood pressure if it's already high. Blood pressure increases as weight increases. Being obese may cause disrupted breathing when you sleep (sleep apnea), which further raises your blood pressure. Losing weight is one of the most effective lifestyle changes for controlling high blood pressure (hypertension). Reducing even a small amount of weight if you're obese can help reduce your blood pressure. You may reduce your blood pressure by about 1 millimeter of mercury (mm of Hg) with each KG (about 2.2 pounds) of weight you lose. Besides shedding KGs, you generally should also keep focus on your waistline. Putting up too much weight around your waist can put you at greater risk of high blood pressure (hypertension). Men are at risk of high blood pressure (hypertension) if their waist measurement is greater than 40 inches (102 centimeters). Women are at risk of high blood pressure (hypertension) if their waist measurement is greater than 35 inches (89 centimeters). These waste size number vary among ethnic groups. Ask your physician or physiotherapist about a healthy waist measurement for you. Regular exercise — for 150 minutes a week, or approx. 30 minutes every day of the week — may lower your blood pressure by about 5 to 10 mm of Hg, if you have high blood pressure. It is important to be consistent with exercise because if you stop exercising, your blood pressure can rise again. If you have high blood pressure hypertension), exercise can help you avoid elevating it. If you have hypertension, regular physical exercise can bring your blood pressure down to safer levels. Some of aerobic exercise you may try to lower blood pressure include walking, jogging, cycling, swimming or dancing etc. You can also try high-intensity interval exercise, which involves alternating short bursts of intense activity with subsequent recovery periods of light activity. Strength training also may help reduce high blood pressure (hypertension). Aim to include strength training exercises at least 2 days a week. Talk to your physician or physiotherapist about developing an exercise program. Diet which is rich in whole grains, fruits, vegetables and low-fat dairy products and skimps on saturated fat and cholesterol can lower your blood pressure by up to 11 mm of Hg if you have high blood pressure (hypertension). Such diet (eating) plan is known as the Dietary Approaches to stop high blood pressure (Hypertension). Maintain a food diary. Writing down what you eat, even for just a week, can shed surprising on your true eating habits. Monitor and observe what you eat, how much, when and why. Try to boost potassium. Potassium helps to reduce the effects of sodium on blood pressure. The good source of potassium is food, such as fruits and vegetables, rather than supplements. Consult to your physician about the potassium level that's best for you. Be a smart buyer. Read food contents when you shop and stick to your healthy-eating plan when you are dining out, too. Even a small cut off in the sodium in your diet can improve your heart health and reduce high blood pressure (hypertension) by about 5 to 6 mm of Hg. 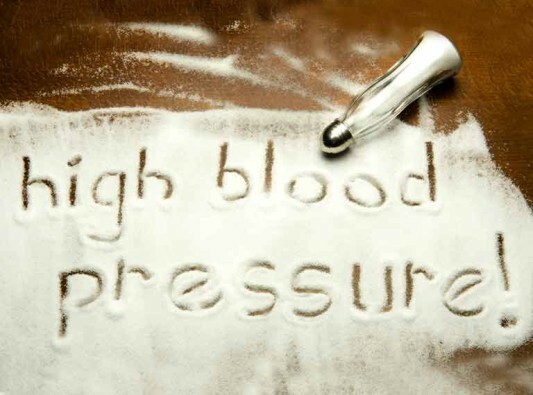 The effect of sodium intake on blood pressure varies person to person. In general, person consume 2,300 milligrams (mg) of sodium a day or less. However, a lower sodium intake to 1,500 mg a day or less — is ideal for most adults. Read food contents. If possible, choose low-sodium alternatives of the foods and beverages you usually buy. Avoid eating processed foods. Naturally Only a small amount of sodium occurs in foods. Most sodium is added during processing of foods. Do not add salt to your diet. One teaspoon of common salt has 2,300 mg of sodium. Use rock salt, herbs or spices to add flavor to your food. If you do not feel you can drastically reduce the sodium in your diet suddenly, reduce it gradually. It will get adjust over time. Alcohol is both good and bad for your health. Drinking alcohol in small amount— generally a drink a day for women, or two a day for men can potentially lower your high blood pressure(hypertension) by about 4 mm of Hg. One drink should equals to12 ounces of beer, five ounces of wine or 1.5 ounces of 80-proof liquor. But its protective effect lost if you drink too much of alcohol. Drinking more than small amounts of alcohol can actually raise blood pressure significantly. Alcohol may also reduce or alter the effectiveness of blood pressure medications. Each cigarette you smoke may increases your blood pressure for long time after you finish. Quitting smoking helps your high blood pressure (hypertension) return to normal. By stopping smoking can reduce your risk of heart disease and improve your overall health and lifestyle. People who stopped smoking can live longer than people who never stopped smoking. The role caffeine in blood pressure elevation is still debated. Caffeine can raise blood pressure up to 10 mm of Hg in people who occasionally consume it. But people who drink coffee on regularly basis may experience little or no effect on their blood pressure. Although the long-term effects of caffeine on blood pressure not yet clear, it is possible that blood pressure may slightly increase on its consumption. To observe, does caffeine raises your blood pressure, check your pressure within 30 minutes of drinking a caffeinated drinks. If your blood pressure increases by 5 to 15 mm of Hg, you may be sensitive to the blood pressure increase effects of caffeine. Consult to your physician about the effects of caffeine on your blood pressure and further action. Excessive stress can contribute to high blood pressure (hypertension). More research is needed to determine the actual effects of chronic stress on blood pressure increase. Occasional stress situation also may contribute to high blood pressure (hypertension) if you react to stress by having unhealthy food, drinking alcohol, smoking or some medicines. Try to change your expectations and related things. For example, plan your day activities and focus on priorities rather than completing each one. Avoid trying to do too much at a time and learn to say no. Understand there are some things you cannot change or control, but you can focus on how you react to that things. Focus on things you can control and make plans to resolve them. If you are having stress at work, try talking to your superior. If you are having a clash with your kids or spouse, take steps to solve it. Avoid stress causes. For example, if pick hour traffic on the office way causes stress, try leaving earlier, or travel by public transportation. Avoid individual who cause you stress if possible. Spend time to relax and to do activities you enjoy. Blood pressure Home monitoring can help you keep control on your blood pressure, make assure your lifestyle changes are working, and alert you and your physician to potential health problems. Blood pressure monitors are widely available and without a prescription. Consult to your physician about blood pressure monitoring at home before you get started. Regular visits to physician are also key to controlling your high blood pressure (hypertension). If your blood pressure is in controlled condition, check with your physician about how often you need to check it. Your physician may suggest checking it daily or less often. If you are making any changes in your medications or other treatments, your physician may suggest you to check your blood pressure starting two weeks after treatment changes and a week before your next appointment. Supportive family and friends can help to progress your health. They may motivate you to take care of yourself, drive you to the physician or get on an exercise program with you to keep your blood pressure controlled. If you feel you need support beyond your family and friends, you can joining a support group. This can put you in touch with people who can give you an emotional or morale boost and who can offer practical tips to handle your condition. Meditation and deep breathing could also fall under "stress reduction techniques. Both meditation and deep breathing are believe to activate the parasympathetic nervous system. This system is involved when the body relaxes, slowing the heart rate and reducing blood pressure. There is quite a small research in this area, the studies showing that different types of meditation appear to have advantage for reducing blood pressure. Deep breathing techniques can also be equally effective. A significant reduction in high blood pressure (hypertension) observed when having ginger and cinnamon tea, both are warming spices that improve circulation, you can make a nice ginger cardamom tea to help your heart get healthy. Every morning, be realistic to watermelon. Many times watermelon is viewed as a strict summer fruit, or for seed spitting contests and barbecues, but it can also help control high blood pressure (hypertension). Watermelon contains a compound called citrulline. Once it enters the body it get converted to L-arginine, which is the precursor to nitric oxide. Nitric-oxide in the body relaxes the blood vessels, which causes your blood pressure to decrease. It is great natural remedy to enjoy. Pistachio nuts, out among other nuts, seem to have the strongest effect on controlling high blood pressure (hypertension) in adults. Cat’s claw is a widespread herb in China, South America, and Central America. It is extensively used in China for the treatment of high blood pressure. Cat’s claw lowers high blood pressure (hypertension) by bringing vasodilation. Dilated blood vessels allowing the blood to flow more simply. It also acts as a mild diuretic and cleans the body of harmful excess fluid. Onions have a powerful antioxidant called quercetin. Quercetin helps lower high blood pressure but also helps treat chest pain, angina, and also drops the risk of stroke and heart attack. The secret to receiving as much of this enzyme is eating the onions raw or lightly cooked. Vitamin-d, the sunlight vitamin, is proven to reduce high blood pressure. Since people are spending less time outdoors people are vitamin-d deficient. Who have three cups of a hibiscus tea daily lowered systolic blood pressure by 7 points in one and half month on average. The phytochemicals in hibiscus are probably accountable for the large reduction in high blood pressure (hypertension). 3nB, a element found in Celery seeds, appears to help lower high blood pressure (hypertension) by acting both as a diuretic and vasodilator, as well as working in a similar manner to drugs known as calcium-channel blockers. This effect may rise the elasticity of the blood vessels and thus lead to lower high blood pressure (hypertension). In addition, 3nB appears to have some effect on areas and systems of the brain that regulate vascular resistance. Beetroot juice is a dominant medicine when it comes to lowering a high blood pressure (hypertension). Some of its properties relate to the minerals it contains, such as potassium and magnesium, but its exact pharmacological action is due to a high content of nitrates. When you sip up beetroot juice, these nitrates are quickly converted into nitrites by bacteria (Veillonella and Actinomyces species) that live on the surface of your tongue, and which are also present in saliva. The nitrites are absorbed into blood circulation, where nitrites are used to make a gas called nitric oxide (NO). Nitric oxide is a cell-signaling molecule which has a dominant relaxing effect on small muscle fibers in blood vessel linings. This causes the blood vessels to dilate so that blood pressure falls. Pomegranates are full of natural ACE inhibitors which stop those enzymes from doing damage to your circulation system. The juice of pomegranate acts as the medications for high blood pressure, but it tastes quite a bit sweeter. Arjuna bark (Terminalia arjuna) is well-known in Ayurveda medicine, where the thick, red bark is the most extensively used herbal cardiac medicine. Modern physicians are also using Arjuna for coronary artery disease, heart failure, high cholesterol and high blood pressure (hypertension). Flaxseed lowers blood pressure in hypertensive patients. It is a great home remedy for hypertension. Good news for chocolate lovers: Eating a small square of dark chocolate daily can support to lower blood pressure for people with hypertension. It has heart-healthy benefits of flavonoids, compounds in unsweetened chocolate that cause dilation of the blood vessels. People with low calcium consumption often have high blood pressure. In addition to dairy, you can gain calcium from collard greens and other leafy greens, beans, sardines and tofu. Here is a complete list. They are also packed with polyphenols, which is natural plant compounds that are good for your heart. Those consuming berries and polyphenol-rich foods experienced better markers of heart disease risk.